This month I am proud to feature a Brotherly Duo by the name of the Walker Bros, Marshall and Shepherd from Swans Island, Maine. These young men are mighty talented with a very bright future in music! They both sing and both pick well and will be appearing with us throughout this summer as a featured act. Our first gig is with the Trio at the Gilley Bird Carving Museum in S W Harbor during the open house bird show, which features the American Oystercatcher from the recent carving class. The Walker Bros will appear with us and the show runs from 1 to 2 pm, so hope you get a chance to come out and enjoy some great COUNTRY MUSIC and bring some family and friends. Refreshments are served during this event and this will be a first with music, so don't miss this one! 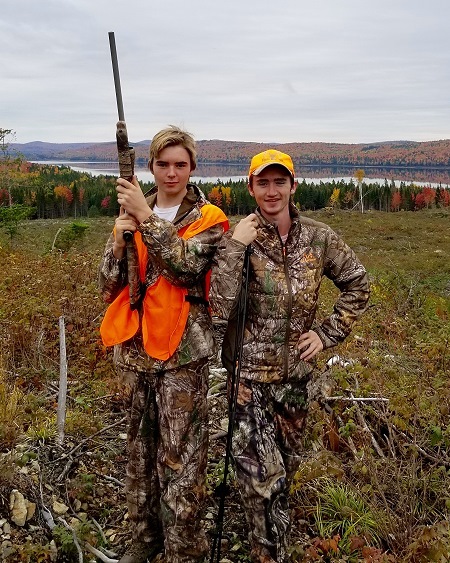 Pictured here are Marshall and Shepherd doing what they love best, enjoying the great outdoors, hunting and fishing! They also haul 400 traps lobstering with their Duffy Lobster Boats! It isn't often that talent such as this comes along, so I wanted to let more of the world hear these young gifted musicians and I have no doubt you will hear much more of them in the years to come, as the sibling harmony continues to shine with each appearance! I hope to write some original music for them to record in the future and support whatever direction music takes them! I guarantee you will love these fine young talented men, so mark your calendars and watch for upcoming appearances on this site! Until next time, thanks for keeping it COUNTRY!